As a composer Alison Vardy is inspired by the rhythmic and melodic diversity of music from many cultures to create original and captivating compositions. Alison truly enjoys playing with the harp's sound for it is the "sound" that truly matters for her. She is attracted to strong rhythms and builds this love into her compositions. Alison's repertoire is constantly expanding as she explores the many voices of the harp. Initially Celtic, then Celtic and Latin and then music of the world translated and arranged for harp. Her current compositions reflects her passion for this multicultural music. 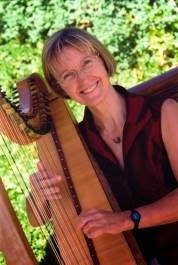 Harpist and composer Alison Vardy lives in Victoria, British Columbia, Canada and performs extensively as a full-time local/regional professional musician on the Paraguayan and Celtic harps for concerts, weddings, conferences, corporate, community and private events. Alison counts herself lucky to have received extensive training on the piano when she was young. 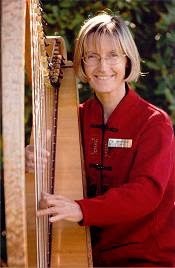 She translates these skills for teaching herself and others on the harp, as well as for arranging and composing her own music. She now performs and composes mostly by ear. She transcribes and further polishes her pieces on the computer for others to enjoy. Alison Vardy pulls the harp close to her and launches into a lilting waltz. Her fingers dance along the thin strings, seamlessly crossing over and under, over and under. Her face is serene and her eyes have a faraway look, as if she is thinking about something else - her garden, perhaps. The music builds into a mesmerizing crescendo, then she suddenly stops to examine her fingernails. “I can hear them against the strings. I’ve been taking liquid calcium - at 54 you have to - and I guess they’re actually growing. Dirty too!” She picks at her nails for a few seconds, then resumes the waltz. Vardy’s studio is in the converted garage of her Fernwood rental home. From the outside, it is an unassuming building. It appears to be a normal converted garage, housing a rec room maybe, or a spare bedroom. Instead, a humidity-controlled forest of harps grows inside, planted around the perimeter of the room: Blevins, Dusty Strings, Another Era Lutherie. Colourful red, blue, and yellow lap harps hang like potted flowers against the cream coloured walls. Beside the door, three of Vardy’s performance harps are safely tucked away in cases. Vardy’s newest harp is a maple Sandpiper from Oregon. She begins explaining how its strings are made of synthetic lamb-gut, then trails off as she starts to play. Her light brown hair is chopped just above the shoulder and her tiny 5’4” frame almost disappears behind her harp. Vardy is not wearing a flowing white gown, nor is she hiding golden wings beneath her leaf-printed vest, but she still manages to look angelic when she plays. So how did someone with a degree in agriculture become a harpist? In 1983, shortly after she and her husband, Stephen, were married, they went on a year-long cycling holiday in New Zealand. It was here they became friends with Andy Rigby, a famous Australian harpist. The Vardys soon visited him in his hometown of Melbourne. Every time Vardy walked past his harp she would run her hands along the strings in a curious glissando, but she didn’t really know what to do with it. Because of the diatonic nature of the instrument, it can only be played in one key at a time, making it difficult to produce really dissonant sounds. So even the first hesitant touch on the strings is capable of producing beautiful sounds. It’s easy to become hooked. After the trip, Vardy and her husband ended up moving to New Zealand. Less than a year later, she bought a used harp. Her attempt at self-teaching led to an injured wrist [due to incorrect hand placement] and a six-month hiatus because of it. After healing, she finally took some lessons, which paid off when she got her first gig¾for the hearing impaired. “They all had their hearing aids on,” she laughs. “I think they liked it, though I don’t know what they heard!” Vardy’s laugh is like walking into a wall. There is no buildup- it appears out of nowhere. And unlike the harp, it is mighty loud. Vardy’s life in New Zealand ended when her allergies became so severe that she required an inhaler just to go up a flight of stairs. 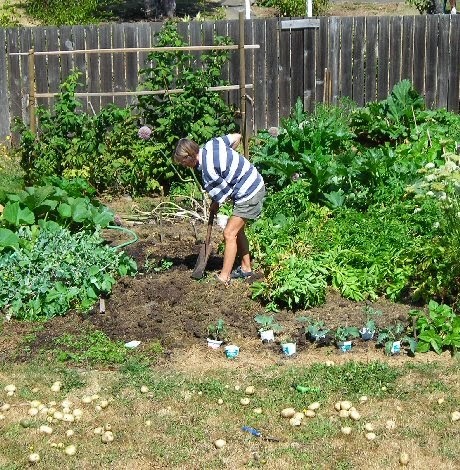 Her husband agreed it would be a good idea to live in a less mouldy house in a drier climate. They found themselves back in Canada, with, as she recalls, “no jobs, two kids, no social insurance, no medical coverage.” Despite their starting over again at the bottom, Vardy feels there is too much of an emphasis on security, pensions and investing. To her, when you don’t have a lot to invest, you just don’t have to worry about it. Her husband describes her as a musician, not a performer. She takes financial blows for her art. She performs for herself, not the audience. If someone requests a song she will play it only if she is in the mood. This mentality extends to her lessons as well. Students have the option of scheduling weekly lessons in advance, but she prefers that they come only when they feel like it. When it comes to earning a living, Vardy says that if it wasn’t for weddings, she wouldn’t eat. She also plays funerals, either at the service or the gravesite, and teaches lessons, but rarely holds public performances. Instead, she focuses on her online harp store. There isn’t a huge profit margin, but she’s not worried that the big harps aren’t moving. They aren’t trying to sell locally; they’re trying to sell online, which means their markets are Canada-wide. Because she is so focussed on the harp store, she admits she hardly ever practices. Instead, she treats her gigs as practice. If she is going to be playing for three hours, she makes sure she keeps herself entertained by playing in different keys or by changing the melody from the right hand to the left. In her studio, Vardy mentions how she is always looking for interesting ethnic music to enhance her repertoire. She grabs a handful of CDs and lists off the places: Peru, Romania, China, Columbia and Zimbabwe. These CDs are more useful to her than sheet music. Vardy says she can’t play by ear immediately, but she’s getting better every day. She gestures to a small cushy footstool. “Get comfortable,” she says, pulling a harp towards her. “This is a beautiful CD. It’s Sephardic music from the Spanish Jews.” She begins to play while explaining the music’s harmonic minor key. I faintly hear her speaking about how the scale starts on the fifth note, but my ears are hypnotized by the beautiful music. And I can’t peel my eyes away from her hands. They are playing with such strength and clarity that they seem magical. They are hands that are as comfortable in a vegetable garden as they are skimming the strings of harps. And I don’t even notice the dirt.